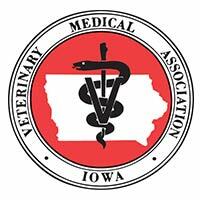 Lynita joined Iowa Veterinary Wellness Center as a client services representative in February 2012. She graduated in 1989 from Snow College in Ephriam, Utah with an AS degree. After moving back to Iowa, Lynita worked at her local humane society until she made the move to her first pet hospital in 2000. After that career move, Lynita realized that this was what she was meant to do. Lynita lives in rural Iowa with her family. They share their home with three very lucky felines, one lone German Shepherd Dog, and one Great Dane. Jessica was born and raised in central Iowa. Her passion for animals was nurtured at a young age. During her formative years, she was active exhibiting hunter-jumpers and was also active in FFA with both horse and sheep projects. 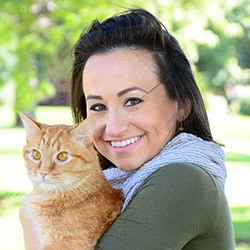 Jessica began working in a veterinary hospital at the age of 16 and has never looked back. 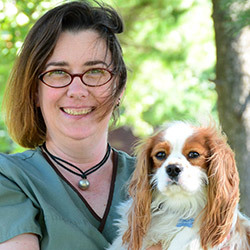 During her college education at Iowa State University and Grand View College, she worked for several area veterinary clinics. 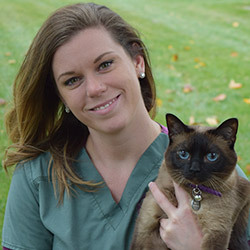 She finally “came home” to stay at Iowa Veterinary Wellness Center as practice manager. Jessica lives in Polk city with her Bernese Mountain Dogs, rescued Cavalier King Charles Spaniels and one lone Eclectus parrot named Layla. Her hobbies include exhibiting her Berners in conformation, draft, tracking and obedience. 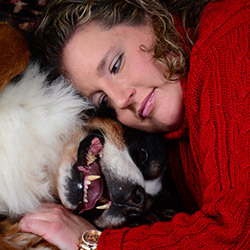 She is active with her local regional Berner club as well as the parent association, the Bernese Mountain Dog Club of America. She is also a very involved Aunt in her three young niece’s lives. As every parent (and super Aunts) can attest, the girls’ activities keep her busy! Christine was born and raised in Chicago, Illinois. She obtained a Bachelor's of Science in Human Physiology from Marquette University in Milwaukee, Wisconsin in 2008. She received her Associates of Applied Science in Veterinary Technology from Vet Tech Institute at Fox College in Tinley Park, Illinois in 2010. 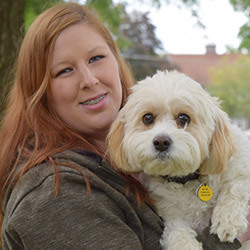 She began her career as a Certified Veterinary Technician in Chicago for 3 years at a general practice animal hospital before moving to Des Moines. She then worked at one of the local emergency rooms in Des Moines for 2 years before joining our team at Iowa Veterinary Wellness Center in April of 2015. Christine lives in Polk City with her husband, Matt, step-son Easton, and two wonderful kitties: Smokey and Zita. In her free time, she enjoys spending time with friends, family, and kitties, as well as cooking, traveling and staying active. Melanie joined Iowa Veterinary Wellness Center as a veterinary technician in 2017. 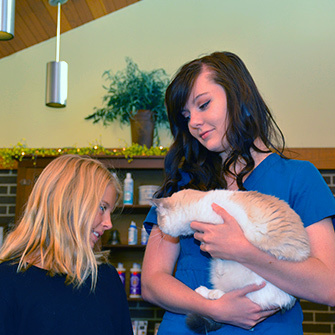 She graduated from the Veterinary Technology program at DMACC in Ankeny, IA, earning her associate's degree. Melanie began her career at Furry Friends Refuge/No Kill Shelter. Melanie lives in Des Moines with her fur babies Mya, a Weimaraner, and Niko, her forever puppy. She enjoys running, crafting and ISU football. Friends and family are her everything. Amanda, like any other veterinary clinic staff member, loves animals. That's why she decided to become a registered veterinary technician. She started her journey by going to Colorado and participating in a vocational school dedicated to animal technology. She earned her RVT title there in Colorado. Amanda moved back to Iowa in 2014 and has been doing the job she loves ever since. 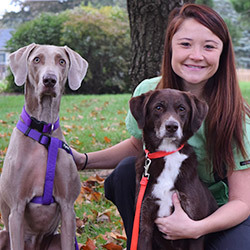 Amanda first joined the Iowa Veterinary Wellness Center team as a part-time technician. She liked the team so much that she decided to join them full-time. Amanda currently has two dogs of her own, an 11 year old German Shorthaired Pointer named Cooper, and a 3 year old German Wirehaired Pointer named Blu. Kara grew up in a small town in south central Nebraska. She completed part of her bachelor's degrees at the University of Nebraska-Lincoln before going to receive her education in veterinary technology from Vatterott College in Omaha, NE. She worked as a veterinary assistant in Omaha for three years prior to joining the Iowa Veterinary Wellness Center team in February 2017. Kara moved to the Des Moines area with her boyfriend Ben of 3 years in January 2017. They share a cozy apartment in Waukee with their two cats, Grace and Gizmo. In her free time, Kara is a representative for the live-clean company Modere. She enjoys snuggling with her cats while watching movies. She also enjoys cooking and spending time with family and friends in Nebraska.